The Park District can make hosting your next event a breeze! Whether you are celebrating a birthday or anniversary, surprising a bride or mother-to-be with a shower, or holding a business meeting, we can help! Our rooms can accommodate from 45 to 120 people seated at tables. Capacity is increased approximately 10% with theater style seating. Consider your need for buffet and gift tables as these will reduce rom capacity. Most rooms allow for serving of food and beverages. Wine and beer may be served but no hard liquor is permitted. You can request use of a 100 cup coffee maker (supplies are not included). Set up is allowed ½ hour prior to your rental start time. If you require more than 30 minutes to set up, please build the additional time into your rental. Choice of 5-foot round tables or 6-foot rectangle tables, seating 6-8 people per table. Two hour minimum rental time. Clean up must be accomplished during your scheduled rental. Your guests must remain in your designated room. Rentals do not include use of any other part of Recreation Center Building. All rentals must be done in person at Tony Bettenhausen Recreation Center. Two forms of identification to prove Tinley Park-Park District residency are required. One must be a Driver’s License and the other a current year’s tax bill or current month’s utility bill. Complete the Rental Request form. If you have not used the online registration feature of the Park District, be sure to obtain your login information when you complete your Rental Request. You will receive an email approval sent to the email address listed on the Rental Request form when your rental is approved. Upon receipt of the approval, log into your account at www.tinleyparkdistrict.org and make your payment. Major credit cards accepted (MasterCard, Discover, Visa). Failure to make payment within 48 hour will result in release of your reservation making the room available to the next renter.. Your rental is not secured until you have made your payment. Please print your receipt! Do not send out invitations until all above steps are complete! The Brickyard is the nickname for the Indianapolis Motor Speedway’s original track constructed from 3.2 million bricks! 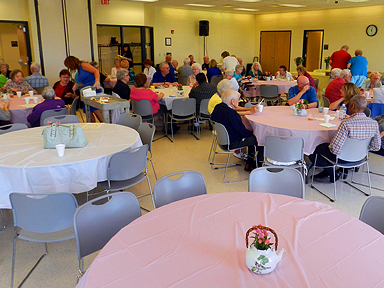 Our Brickyard’s 2,500 square feet can accommodate up to 120 people. The Brickyard comes with the use of a full service kitchen with and separate sink and beverage area. Brickyard A: Half of the room described above with shared use of the kitchen and seating for 64 guests. Brickyard B: Same as above with no kitchen. There is a sink and beverage area for your use. The Daytona Room is named for the famous Daytona International Speedway. This carpeted room is perfect for meetings; food is not permitted. Daytona Room can hold 45 people and does have a beverage/sink area. Tony Bettenhausen won championships in Midget car racing in 1942, 1946 and 1947 at the Milwaukee Mile. The Milwaukee Mile room can accommodate 45 guests and features a sink and beverage area. Located in nearby Blue Island, Tony Bettenhausen was champ on this course in 1941, 1942 and 1947. This room is 850 square feet (25×33) accommodating 45 guests and includes shared use of the full service kitchen. This room gets its name for the garage area at Indianapolis Motor Speedway. The space can accommodate 45 guests. There is no sink or kitchen available with this rental. This room is ideal for seminars or meetings. Looking for a place to hang out with your friends, throw a birthday party, or just relax and have fun? You can now rent the Pit Stop! Rentals are held on Saturday and Sunday throughout the year. Rentals are 2 hours in length. An adult 18 years or older must be present throughout the rental. Attendees must be 10 & Older. 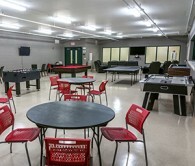 Equipment includes ping pong, billiards, Wii, Playstation 3, Xbox 360, climbing wall, light wall, foosball, and more! Pit Stop supervisors will be on hand to assist with equipment. A maximum of 25 people are allowed in the Pit Stop per rental. Renters must contact the Recreation Supervisor, Meghan Fenlon, at (708) 342-4213 and give a 4 week notice for rental inquiries. A maximum of 25 people are allowed in the room at once during rentals. Looking to give your team a little more practice or just want to have some fun? 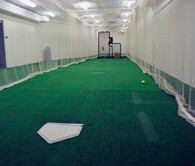 Our new batting cage will offer opportunities for all ages. Slow pitch to fast pitch baseball. Participants can even choose to forgo the pitching machine and give their arm a workout on the pitching mound. Rentals will include enough space in your own private room to have team meetings, go over fielding assignments, or even run small drills while others are working on their swinging or pitching in the cage. All rentals must contact the Athletic Supervisor, Ron Woodworth, at (708) 342-4208 and give a 4 day notice for rental inquiries. Please note: a maximum of 6 people are allowed in the cage area at one time during rentals. Perfect for groups or individuals! The Tinley Park Performing Arts Center is available to host your next event! 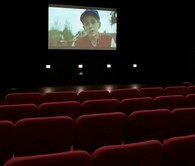 The 120-seat theater is equipped with professional audio/visual equipment. Call Recreation Supervisor, Erin Crotilet, at (708)342-4212 to book your event.